Pont d’Ouche is not even a small village, just a hamlet, a place. 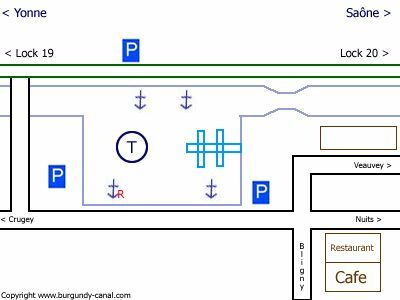 However there is an old saying… “you can not say you know the Burgundy Canal until you stay at least one night in the port of Pont d’Ouche”. A small cafe, a few houses, a few bridges, a couple of streams, one canal and that’s about it, but take a closer look and enjoy. Located on the river Saone side of the canal, between look house 19 and 20, it is an excellent place to moor, there are even look term mooring available. This is where the river Ouche finds the canal and follows it down to the river Saône, one the the very few aqueducts on the Burgundy canal. Once upon a time there used to be an important tile production, with the barges taking the roof tiles as cargo towards the main cities. There have been some wonderful photographs taken at the port, there is often an early morning mist and a mirror reflection on the canal surface. At sunset you often see dear and wildboar coming down from the forest. For barges there are good deep moorings. Some are reserved for hotel barges, so check before mooring. Water is available from the boat base. The pontoons are reserved for the smaller boats, supplying water and electricity. Up stream from the port behind the bridge is a slightly more discrete mooring. Be careful when crossing the viaduct towards lock number 20, as the canal is very narrow, make sure you have enough room to pass other boats and watch out for the strange current if the lock is being filled. Colombier 5 kilometres, a good steep walk, a very difficult bicycle ride.